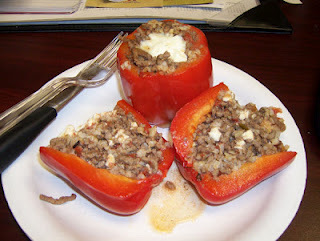 I adore stuffed peppers but the standard recipes are high carb (they add breadcrumbs, rice, quinoa or black beans) and I need low-carb. Now, if you do have room for carbs, go for it and add them in! This is a tasty dish when you add those starchy carbs, thankfully though, it's just as tasty without ;-) During competition prep, this was one of my favorite recipes! 1. Brown ground beef with both Mrs Dash seasonings. Drain. 2. Add the mushrooms & crushed tomatoes. 5. Top each with 1 tbsp crumbled feta. 6. Place peppers in individual steamer bags (depending on the size of the peppers, sometimes you can fit 2, sometimes only 1), standing them up with their open tops on the "cook this side up" side of the bag. 8. When ready to cook, place bag in microwave and cook for 4 1/2 minutes. Allow to rest in the bag for an additional minute. Serve!